The range of the cabbage leather coral is the Red Sea and Indo-Pacific. The habitat of cabbage leather coral is near shore in shallow water, flat reefs and attached to rubble-like substrates. The Cabbage Leather Coral releases toxic terpenes (poisons that ward off encroaching corals). The Sinularia genus consists of a large number of species and subspecies, which are predominately soft corals. In the wild, leather coral reproduces asexually in several ways, such as fission, budding, fragmenting and/or branch dropping. With asexual fragmentation, a section will separate from the parent colony and attach itself to another suitable location. In an aquarium environment this can be done using a scalpel or a blade by physically cutting a section off of the parent colony and transplanting it to a new location. Sinularia corals have several different methods of feeding. They are photosynthetic, having a symbiotic relationship with the zooxanthellae algae that live in their tissue. Zooxanthellae provide them with oxygen, nutrients via photosynthesis, and aid in waste removal. 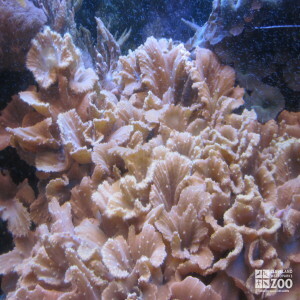 Cabbage Leather Coral can also use its polyps to obtain nutrients from microscopic food in the water. Proper lighting is essential for keeping any living corals in the aquarium.